Located 3.2 km away from Crystal Pier this Pacific Beach motel features BBQ facilities on-site and free guest parking. 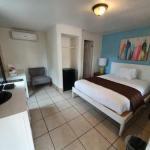 A cable TV is provided in each air-conditioned guest room at Motel San Diego. For convenience a microwave and a small refrigerator are included in all rooms. A guest launderette is offered to guests of San Diego Motel. Vending machines featuring drinks are available. SeaWorld San Diego is 6 km away from this motel. The San Diego Zoo is 15 minutesâ?? drive away. Belmont Amusement Park featuring the Giant Dipper Roller Coaster is 8 km away.